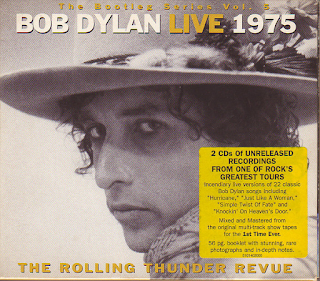 Recorded at various locations on the first half of 1975's "Rolling Thunder" tour. This is my preferred live recording from the "Rolling Thunder" tour. Although it is not one complete concert, neither does it replicate a set list it does sort of play as if it were a concert. The recordings are from a fair few different venues and are from the widely accepted superior first half of the tour. 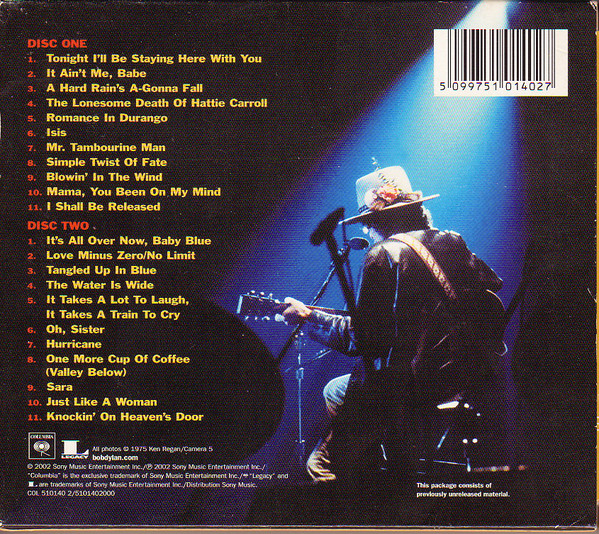 The venues are all indoors, and consequently the sound is much better than the muffled outdoor venue sound to be found on "Hard Rain", the other live recording from this tour, from the second half. The sound is pretty good on here throughout and Dylan and the band are on fine form overall, with an early tour freshness and vitality about them. 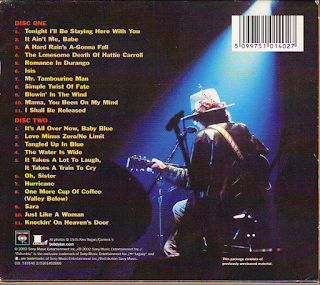 Highlights are a slightly reggae-ish "It Ain't Me Babe"; a rocking, guitar-driven "A Hard Rain's A-Gonna Fall"; a bassy, shuffling "The Lonesome Death Of Hattie Carroll"; (good to hear those older tracks given a run out); and the "Desire" tracks, which are all done excellently, augmented by Scarlet Rivera's unique violin. Check out her contributions to "Oh Sister" and "Hurricane". "Simple Twist Of Fate" is performed in the original, acoustic "Blood On The Tracks" style, which is nice to hear. "Love Minus Zero/No Limit" is done beautifully, also faithful to the original. The same applies to "Tangled Up In Blue". Dylan is often the great re-interpreter of his material, and while some of the songs on here are given new makeovers, I like the fact that some of them are played straight. "It Takes A Lot To Laugh, It Takes A Train To Cry" is played with a verve and vitality as if it were a new track, as opposed to being recorded ten years previously. There is a lot of energy and enthusiasm on this album.